Dissolve dry yeast in warm water & milk. Take a bowl, add plain flour, yeast,yoghurt,milk yeast mix,salt to make a dough. Keep in aside one hour. Dough will raise double, make into equal balls . Preheat the oven 200* degree. Flatten the dough. Take an oven tray & turn it upside down &wrop with aluminiumfoil. Place the flattened dough on the foiled tray & bake it 10 mins. 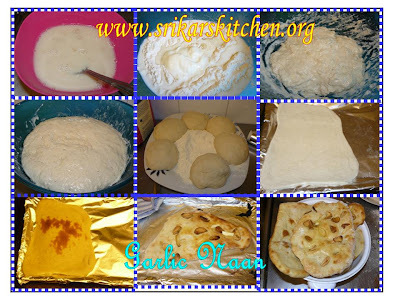 This is basic naan bread.There can be variations made by adding different ingredients. Roast sliced garlic in olive oil. Before baking top the flattened dough with roasted sliced garlic. Brush it with butter to call it butter naan and whatever variations you name it. Serve with any kind of raithas or Curry dishes. oh, it looks soft and delicious!!! wow..am tempted seeing your recipe..will make it today..
Wow Garlic Naan looks scrumptious Sripriya..am drooling now here.. Yum...I love naan. It's been too long since I have had some. Maybe I should just come over for some???? Wow hot, spicy and yummy. 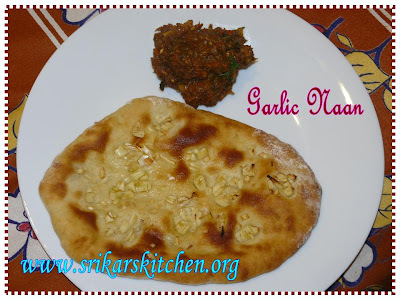 Garlic Naan, yummy. I like the inclusion of garlic in naans, breads etc. Wow naan looks so yumm. Hmmm... Garlic naan.. so lovely! I want to grab it right now. Love soft, fluffy, garlic naans. looks great. Just beautiful and i love garlic naan! Yum, and just when I thought naan couldn't get any better! hey i love the garlic flavor in naan....did u use allpurpose flour or wheat flour??? garliv naan is an all time favourite. Great job! I love garlic nan. Looks perfect. I made this for dinner today. YUMMMMMMYYYY! Thanks for the recipe.